Now you can have all of the convenience and all of the credit without the cost of those expensive store-bought mixes. 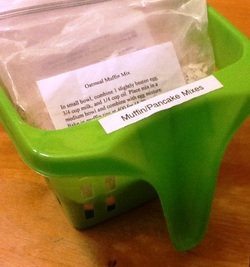 With these homemade mixes at the ready, you'll have delicious, from-scratch muffins, pancakes, bread and pizza on the table in minutes. Get out all the ingredients for each mix just once and make up 6 or more batches at a time for big time savings. Store the batches in separate jars or zippered bags (they can be re-used if filling again with the same mix) and follow the instructions on the label when ready to use. Easy peasy! The recipes below are for the mixes. Click on the related PDF for each mix to download a set of 6 printable labels/instructions for each one. Note: This mix requires use of a bread machine. Place 1 cup sugar in a separate bag and bundle the two bags together. These delicious muffins are a great way to sneak some extra servings of fruits and vegetables into your kids' diets. This is a modified version of a recipe found on superhealthykids.com. The best way to do this is to make several batches of fruit and veggie puree and several batches of the dry ingredients. The above amounts should make approximately 3-4 batches of puree. The above amounts make enough for one batch of muffins. Note: Try to break up the brown sugar and mix it into the flour to keep it from hardening during storage. Thank you Six Sisters for the oven pancake recipe that inspired this mix. It was a huge hit with my kids on Christmas! *An equal amount of all-purpose flour may be substituted for the whole wheat flour, if desired.